Plantar fasciitis means pain in the bottom of the heel. Plantar is the sole of the foot; Fascia is the tissue; and itis is Greek for inflammation. For example, colitis is literally colon inflammation. The plantar fascia is a thick ligament (ligaments attach bone to bone) that connects your heel to the front of your foot. 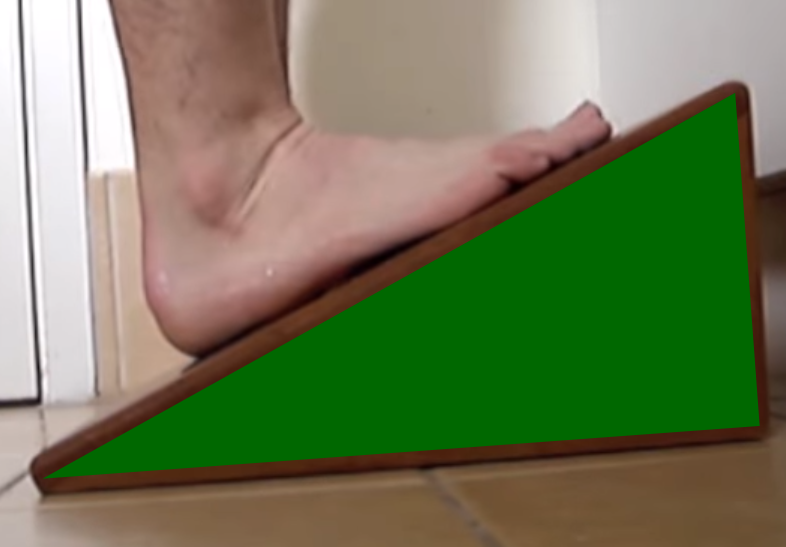 It supports the arch of your foot and helps you walk. The major complaint of those with plantar fasciitis is pain on the bottom of the foot near the heel. It usually affects just one foot, but it can affect both feet. Some people describe the pain as dull, while others experience a sharp stabbing pain. The pain is usually worse in the morning when you take your first few steps, although it can also be triggered by long periods of standing or rising after a period of sitting. Climbing stairs may also be difficult due to heel stiffness. The pain is usually worse after exercise, not during. Plantar fasciitis a very common orthopedic complaint. Your plantar ligaments experience a lot of compression in your daily life. These ligaments act as shock absorbers, supporting the arch of the foot, unless the mechanics of your feet are altered in some way. When the fascia fails to offer the appropriate shock absorption, too much pressure on your feet can damage or tear the ligaments; the fascia becomes inflamed, and the inflammation causes pain and stiffness. Weight – being overweight increases the pressure on your ligaments – especially if you have sudden weight gain, for example, during pregnancy. Types of exercise – Activities that place a lot of stress on your heel and attached fascia. Long-distance road runners – off road runners are at less risk – jumping sports and ballet dancing for example. Occupation – a job that requires being on your feet most of the day, such as working in a factory or a restaurant, and even teachers. Foot mechanics – Having very high arches, flat feet or tight Achilles tendons. Shoewear – Sudden change to your usual shoewear. Active men and women between the ages of 40 and 70 are at highest risk, and it is also slightly more common in women. Initial home treatment includes staying off your feet and applying ice for 15 to 20 minutes, three or four times per day to reduce inflammation. Using generic arch supports in your shoes (bought at most drug stores) and doing some soft tissue work and stretching exercises may also help to relieve pain. Soft tissue work may help to break up sticky tissue adhesions and stimulate healing. Use ice after each session. 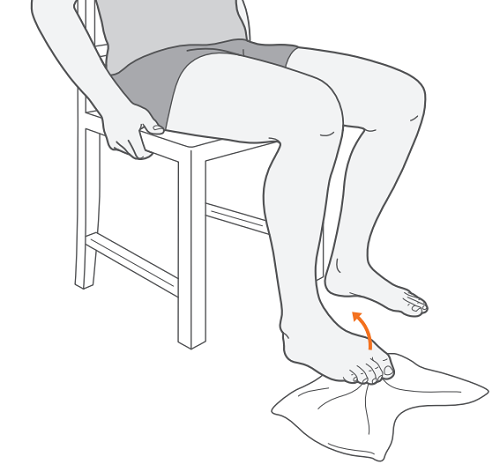 Picking up a towel: Sit on a chair and put one foot on a towel. Now grip the towel with your toes and try to pick it up. Hold it for 10 seconds. Repeat five times. Ball massage: Roll a tennis ball quite firmly back and forth over the sole of your foot. Treat the whole sole of your foot from forefoot to heel. Ouch – heads up, this is painful! Achilles stretch: Find a sloping driveway or hill. Look for an angle approximately 45 degrees. This stretch is often shown on stairs, but I prefer to support the heel. If you have a carpenter in the family, have them DIY a stretch block for you. You may benefit from seeing a podiatrist who specializes in custom-made orthotics. They can also recommend appropriate shoewear and exercises. Your doctor or healthcare practitioner may also recommend ultrasound or Low level laser therapy (LLLT) which is painless and non-invasive; plus my mother swears by laser treatment, after her acute fasciitis resolved with just one session!